I've come across many Black Bean Brownie recipes, but I don't think I've ever been 100% satisfied with one... there would either be too much sugar, too much butter or too many eggs. Or I was allergic to half of the ingredients (I'll be posting more on this later). All I wanted was a brownie that tasted authentic, sweet and fudgy, like it was from a bakery. I didn't want black bean taste at all, I didn't want it to be cakey, I didn't want it to be bland. I got all I asked for with these brownies!! These are super fudgy, super moist and super chocolatey! However, it was no easy task... these brownies caught me off guard in so.many.ways. It's actually kind of ridiculous how many mistakes I made in the baking process, how many things I forgot, and how many things I wasn't supposed to do. But despite all of my mistakes, the end result somehow turned out incredible. Onto my mistakes, shall we? First, I wanted to bake these using brown rice flour as the combination of rice and beans create a complete protein. However, I ran out of rice flour just last week and had to sub in quinoa flour. Wow, my first mistake and I was already a nervous wreck! This was my first time using quinoa flour and I didn't know how it would taste or what kind of texture it would provide. 1. Preheat the oven to 350 degrees Fahrenheit and line an 9" brownie pan with parchment paper both ways, set aside. 2. In a small bowl, stir the flaxseed and almond milk together, set aside to thicken. 3. In a medium-sized mixing bowl, whisk together the dry ingredients and set aside. 4. Rinse ~1 cup of fresh blueberries and puree in a blender. Pour all of the puree into a cup (no need to rinse out the blender, but try to pour at as much as possible). Measure 1/2 cup + 1 tbs and add back into the blender (drink the remaining blueberry puree ;D ) along with the black beans, oil, vanilla and thickened flaxseed mixture. Puree until all of the beans have been liquified. Pour into a clean large bowl. 6. Scoop the batter into the prepared brownie pan and spread to the edges. Bake for 45 minutes. To test if the center is cooked tap the surface and if it's firm and springs back, it's ready. Let cool for about 30-40 minutes in the pan, then flip onto a drying rack top-side/ugly-side down. Peel off the parchment paper and let cool completely before slicing. 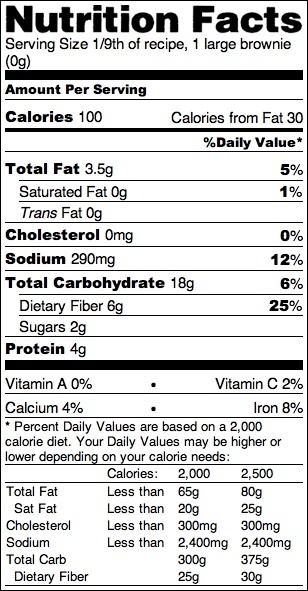 Finally, the nutrition label you've been waiting to see! I never thought this day would come! 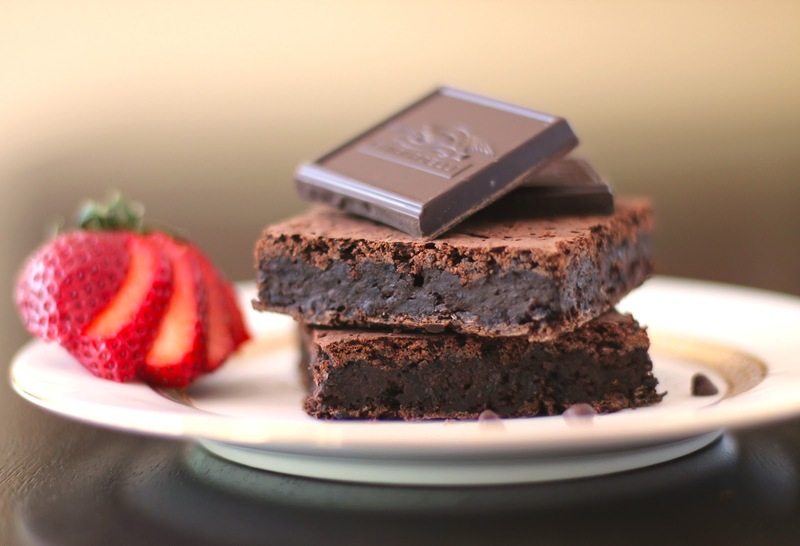 A 100-calorie brownie that tastes like 1,000... a brownie that is super fudgy yet low in fat... a brownie that is full of flavor yet low in sugar. I seriously couldn't believe how good these were. Especially after my gazillion kitchen errors. Feel free to grab an extra brownie, no guilt involved! I'm in heaven. These truly taste like bakery-style brownies (especially the corner pieces!). Next time I make these I'm going to add 1/2 tsp of butter extract to make it even more "bakery-style." PS: try the peanut butter swirl version! these look so delicious! i'm on a diet right now and all I've been craving is chocolate cake, chocolate cookies, chocolate brownies, etc and these seem to fit into my diet! is there anyway i could use all stevia instead of Granulated Erythritol? Hi Katie, I'm sure any other granulated sweetener (like stevia) may work in place of the erythritol, but I wouldn't recommend using liquid stevia. The erythritol adds denseness and a good texture. As long as it's a granulated sweetener, I'm sure it'll work. Good luck! Oooh these look magnificent. Chocolate is my weakness... Can I sub the quinoa flour for any other type of flour? I will try these brownies with one change. i do not ever use canola oil as it is not real, i only have grape see oil in my cupboard. I gotta get some grapeseed oil, I don't use canola either. It's either olive oil or coconut oil in my cupboard. And Jessica, I swear, you have got to be one of the onl people who are lucky enough to "mess up" while creating a recipe but yet it turns out splendid anyway! It's never worked like that for me :( Sad face. I'll let you know how it goes when I make these. I have a can of black beans in the cupboard just waiting to be used and I've been searching for a good recipe. Wow, these look so good! Beautiful pictures! These look amazing! 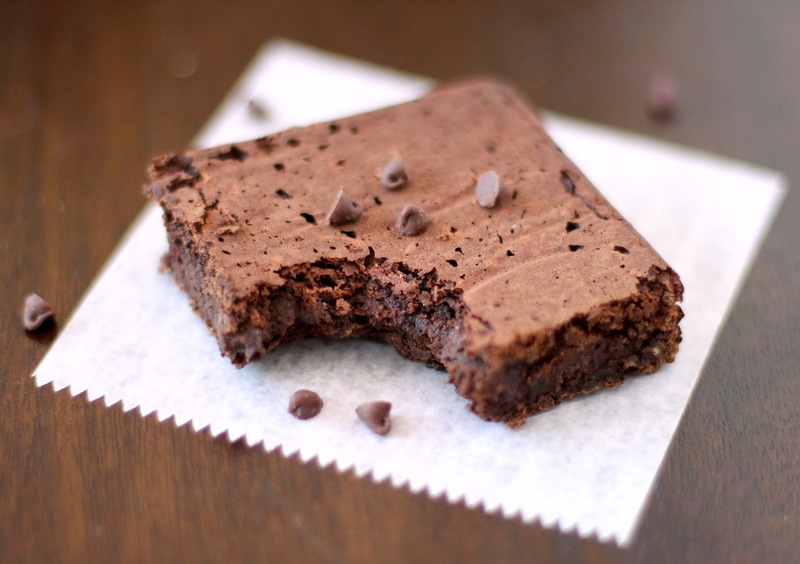 I haven't found an egg-free black bean brownie recipe that looks this good - until now. This is on my "to make" list! Hi Jessica! I just found your blog on food gawker and I am obsessed with your recipe!! 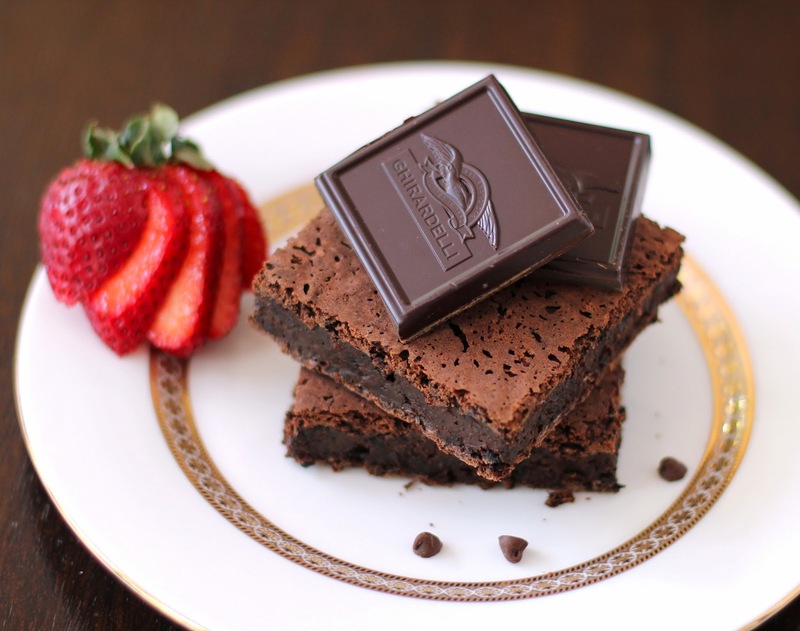 I'm so excited to dig through the rest of your site :) These brownies look so good! Have you tried anything other than the Quinoa flour? I'm wondering if regular flour would work? can I use ground chia seeds instead of ground flaxseeds? Yup, as long as it forms a gel. Chia and flax can be used interchangeably as egg replacers. I haven't tried freezing these but I'm sure they can. I would tightly wrap them and leave them at room temp overnight so they'll be ready to eat the next day. This works with my pound cake recipes well, so I would assume this would too. I'm so glad you liked the brownies! Great idea to cut them up into 12 pieces (thats 70-80 calories each)... genius. AFTER cooking, measure out 1+3/4 cups of the cooked beans for the recipe. 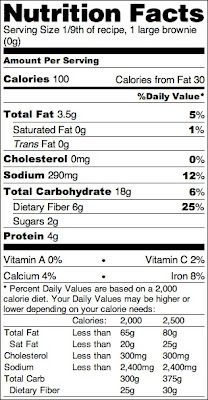 How did you create the nutrition facts label? I'd like to do that for some of my own recipes. I found a couple of sites that analyze recipes to give you the calories, fat, protein, etc., but I haven't found one that gives the standard nutrition label like you provided. It's a really great and helpful tool, it just takes some time because you have to go through each ingredient's label. Thanks so much, Jessica! I'm testing out these brownies tomorrow. Can I sub applesauce for the pureed blueberries? And would I use the same amount? I find that blueberries are a little thicker than applesauce, so if you use applesauce maybe use about 7 tbs (or 1/2 cup - 1 tbs). Hopefully this works for you! Hey Jessica! I made the brownies today, and they are great!! I ended up using the pureed blueberries after all. I did make one small change to the recipe; I substituted unsweetened organic applesauce for the canola oil. The optional chocolate chips were a great addition! Hi Jessica!! I have already tried some of your recipes and they are awesome!! and I am planning to make this recipe this week, but I just have amaranth flour, is it okey if I use it?? I've never used amaranth flour before but I don't see why you wouldn't be able to use it. If you can, use amaranth flour to replace the quinoa flour only and not the oat flour... but if amaranth is all you have I really hope the brownies works out! Could you use pumpkin puree in place of the blueberry puree? Hi Jessica, just wanted to tell you that your recipes are great and I love being able to bake while still being healthy and high in protein. Hi Gabrielle! I'm so glad you are doing a bake sale for the Heart Foundation, kudos to you :) And yes, you can use sugar instead of erythritol at a 1:1 ratio. Could you use powdered stevia instead of Erythrotol? Sorry, stevia can't replace the erythritol here. Erythritol adds bulk to the recipe, just like regular sugar would... you can try it out if you like, however you might need to add an extra tablespoon or so of flour or cocoa. do you think using chickpeas instead of black beans would have a big effect on the taste or the way these brownies cook? OK, so I made these brownies tonight and they were sooooo good! Chocolately, fudgey, with a slight crust on top.....yum! They had a very similar texture to regular brownies. The only regret I have is not making two batches! My kids couldn't get enough. The only change I made was I used pumpkin puree instead of blueberries. I also added about 1/3 cup of chocolate chips. I will certainly be making these again and again and again....you get the point. Thanks for such a wonderful recipe! Sorry, forgot to add that I used coconut sugar instead of Granulated Erythritol, didn't use the instant coffee, used coconut milk instead of almond milk (due to nut allergies) and used olive oil instead of canola. I guess I did make a few more alterations than I mentioned before but they still turned out great! Hey I love your blog and I can't wait to try some of these recipes! This one is very exciting, but for religious reasons I don't drink/eat coffee. Is there something else I could substitute? You can omit the coffee completely if you like, it just enhances the chocolate flavor :) A handful of chocolate chips in the batter will compensate for that! I just made these brownies tonight (only I used brown sugar since I do not have any other sweetener, and pumpkin puree in place of the blueberries). Man. These are fabulous. 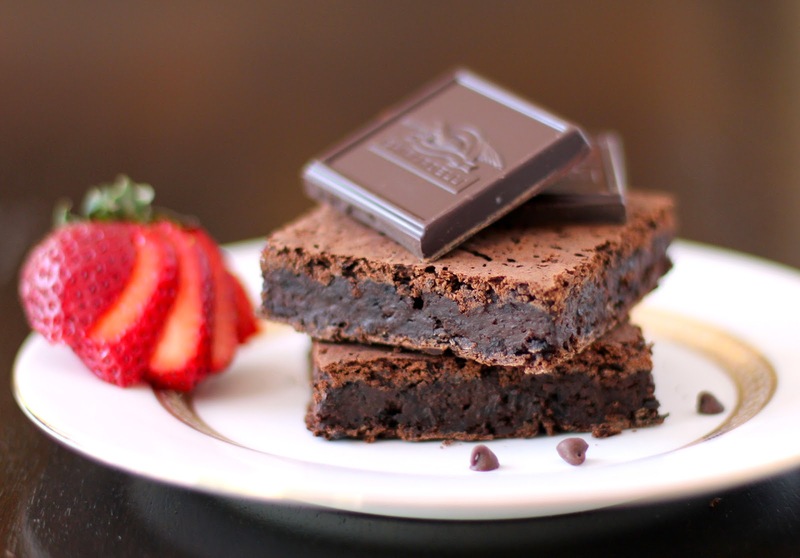 I am a chocolate addict, with a weakness for gooey fudgy brownies! The remarkable thing was these hit the spot without me having to reach for seconds or thirds. They are that satisfying! Thank you for your dedication to creating healthy recipes. I am looking forward to trying others! I'm so glad you liked the recipe :) And using pumpkin instead of blueberries sounds amazing, I need to try that. Thanks Amanda! Disclaimer: I like healthy desserts, but TASTE is always top priority for me. I have tried the "chickpea cookie dough" recipe bouncing around the Web and thought it was the most disgusting thing on Earth. However, I built up the courage to make these, and THEY ARE INCREDIBLE. I prefer them to regular brownies. SOOO good. I used just 1/2 cup cocoa powder, since that's all I had, replaced the erythritol with sucanat and the quinoa flour with spelt, subbed the pureed blueberries with one pureed and peeled apple, and stirred in about 3/4 cup of chocolate chips. HELLO AMAZING. I think the chickpea cookie dough is definitely a bit controversial taste-wise. I love it, my sister hates it, my friend likes it, another is unsure. But, as for the brownies, I'm so glad you liked them! These brownies are the first desert that everyone in my family both would and could eat! They are wonderful! We used grapeseed oil, left out the coffee and added the optional chocolate chips. Even the allergy-free picky children in the family were happy with these. Thank you very much! These look amazing, I have to make them! But, as I can't find Quinoa flour where I live, do you think I can substitute it for Almond flour? I've not used Almond flour before and I'm not sure if the almond taste would be too overpowering, kinda like with Coconut flour. I'm sure almond flour will work and won't provide a strong flavor, seeing as the recipe only calls for 1/4 cup. Hope you like the brownies! Do you think this recipe would work with coconut flour instead of quinoa flour? I wouldn't recommend coconut flour because it absorbs a lot of liquid and would make the batter too dry. I would recommend oat flour or brown rice flour. Hope this helps! I am SO VERY HAPPY to have found your blog. Thank you for every single recipe. I can't wait to try them all! my brownies are different on top...but normal brownie consistency on bottom. my brownies are NOT sweet at all. Are they supposed to be sweet? Would those 2 changes make that much of a difference. Hi Lauren, I'm not sure why your brownies turned out not very sweet. In the directions, I say to flip the brownies onto a cooling rack "top-side/ugly-side down." You should serve the brownies upside down because they are better looking that way. I have never used granulated stevia, but I would say that is the only plausible reason why your brownies aren't sweet. Brown rice flour should work well as a quinoa flour substitute, I have used the two interchangeably in my personal experience. I hope you get a chance to make these brownies again and I hope you get better results!